of the island of Crete, also Europe's closest situated point to Africa. Inspired by the widely known quote by philosopher, anthropologist and enlightened earth child Terence McKenna, the recordings of whom Abyss X has featured in countless mixes and DJ sets, “Nature Loves Courage” proposes an intimate experience for the festival goer. With a very limited capacity of 350 people, the festival's open-air venue is located next to one of Crete's most compelling beaches, also clothing optional, in Sougia Bay. The venue's location suggests a relaxed and profound affair, away from the usual club/ warehouse/ institutional setting where line ups of this nature are usually witnessed. 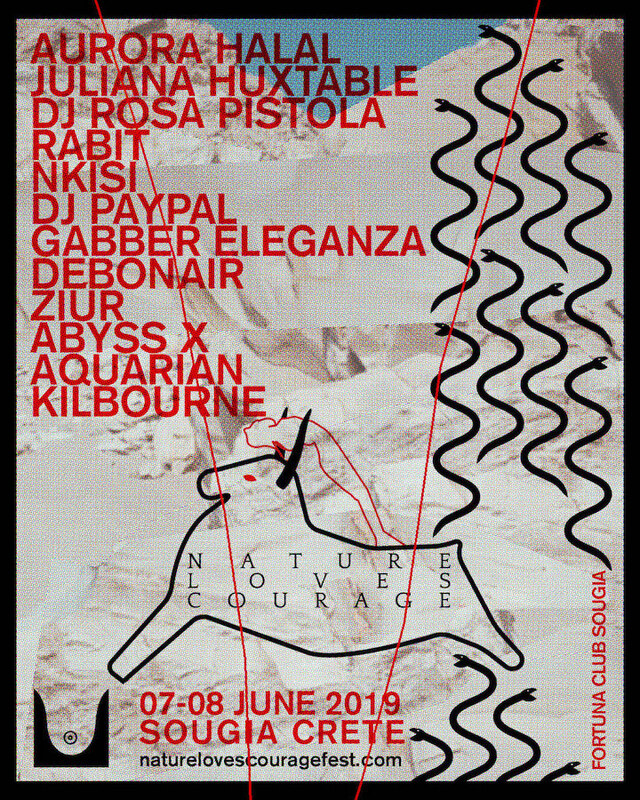 The festival's schedule will allow attendees with the time to explore their surroundings and engage in nature related activities during the day, as well as indulge in the madness brought by the all star lineup comprised by Aurora Halal, Juliana Huxtable, DEBONAIR, Nkisi, Rabit, Ziúr, Gabber Eleganza, DJ Paypal, Aquarian, Kilbourne, Abyss X and more later in the evening, following the setting of the sun. This is not the first time Abyss X pays tribute to her motherland, the themes and legends of which have been in the center of her interest and creative practice for some time now. As she states herself “it is important to introduce this part of the world to an audience with a curious mind whose visit on the island operates beyond the sole purpose of tourism and leisure”.